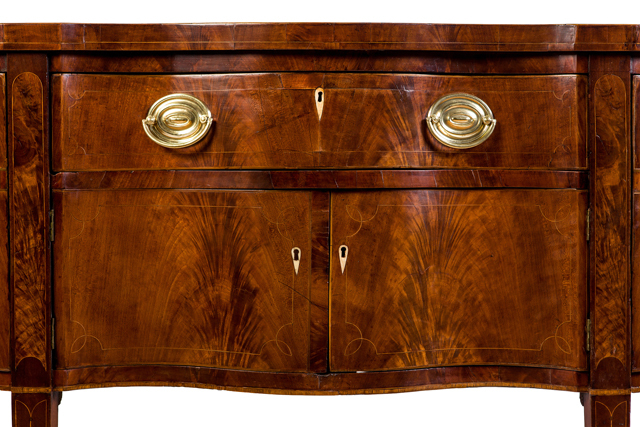 Earlier this year, The Speed Museum purchased an extraordinary Kentucky-made sideboard. 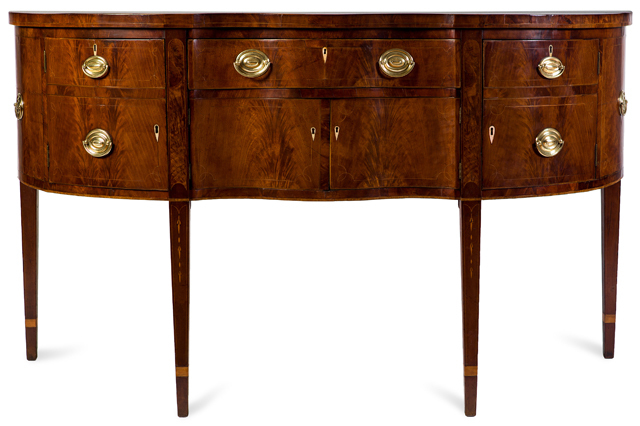 Its complex profile, richly figured veneers, precise inlays, and the exceptional quality of its craftsmanship place it among the most ambitious Kentucky sideboards to have survived from the early nineteenth century. It was made between about 1800 and 1815, probably in Lexington or its surrounding area. It is not known who originally owned the sideboard. The previous owner, Robert Brewer, acquired it from Eleanor Hume Offutt, one of the most important early dealers of Kentucky antiques; she had opened Wilderness Trail Antiques in Frankfort in the late 1920s. He purchased the sideboard in 1951at the urging of his mother, Juliet Goddard Brewer, an influential early collector of Kentucky antiques and an outspoken advocate for preserving Kentucky’s architectural heritage. Sideboards have symbolized status throughout their history. In the Middle Ages, wealthy diners might sit to eat at a “side-board”, a type of table set along the side of a room. By the late seventeenth century, the “side-board” had evolved into a service piece, used to hold wine bottles, silver, dishes of food, and other items. The sideboard as we recognize it today, offering a combination of storage and display, developed in the eighteenth century. Within its drawers and compartments, owners stored textiles, silverwares, liquor, candles, and similar domestic goods until they were needed for use. Early nineteenth-century Kentucky: estate inventories and other documentary sources show that sideboards were often among the most expensive pieces of furniture one could own. Inlay had become the preferred decorative treatment for fashionable American furniture in the late eighteenth century. The cost of inlaid furniture was considerably higher than for plain examples, so most furniture made in Kentucky in the late eighteenth and early nineteenth centuries would have had little, if any, of the inlaid decoration affordable only for those who had the economic means to pay beyond the utility of an object. In Kentucky, regional differences in inlay styles and patterns evolved and today frequently assist in the identification of local schools of early Kentucky cabinetmaking. For example, though the form and inlay of this sideboard were influenced by Baltimore cabinetmaking practices, the decoration on its legs exhibits a distinctive bellflower and line pattern. Similar decoration has only been found on a few other Kentucky pieces, all of which most likely came from the same maker or shop. To date, the group includes The Speed’s sideboard, a pair of dining table ends, and possibly a blockfront card table. Fortunately, Robert and Kathy Brewer treated this sideboard with great care for over sixty years. As a result, the sideboard remains relatively undisturbed. Preserving, analyzing, and understanding its layers of history became a team effort between furniture conservators, an analytical laboratory, and The Speed’s curators. Several months of conservation treatment and technical analysis included microscopic examinations of wood samples as well as x-ray fluorescence spectrometry and Fourier transform infrared microspectroscopy to analyze the compositions of different materials. Some of the discoveries? The sideboard retains an old finish history comprised of shellac coatings. Shellac is made by dissolving in alcohol the resins secreted by particular types of insects, including the so-called lac beetle. The wood used to make the inlay along the bottom edge of the sideboard is most likely eastern hophornbeam, a hard, heavy wood that grows in Kentucky but rarely seems to have been used by early Kentucky cabinetmakers. Three of the “bone” shields around the keyholes are twentieth-century replacements made from celluloid, an early type of plastic. During conservation, one of the celluloid shields was replaced with a new one made of bone; two celluloid examples still remain.